We’d moved Maggie out of the kids’ room (with it’s cheery sun, rocket ship, and a guy in a tree), and into her own space — what used to serve as our guest room. It didn’t work so well for us to have guests sleeping on the couch. Tomas and I both work from home & need space to spread out & space to file papers. We kept tripping over each other, & bumping into our huge table where it was before, and I felt too far removed working from my desk in my bedroom. The craft table itself ended up being the place that everyone, and I mean everyone, dumped their papers & junk on, so there was never a clear space for work or crafting. We’ve reconfigured the tables so they line a wall, and brought in the queen sized bed (covered by an amazing blanket my sister brought back from Afghanistan on one of her many trips there), and moved Tomas’ drafting table to the opposite corner. The bookshelves piled high with kids craft and activity books is still here, but by the door (not visible in this picture). It is amazing what the reconfiguartion has done for us! 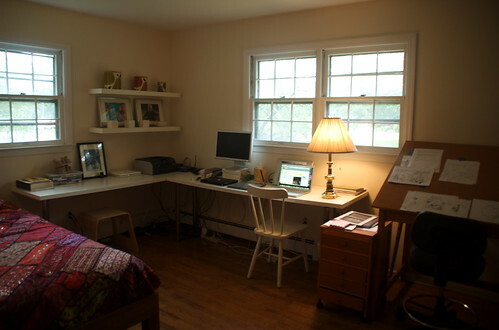 Everyone ends up in this room for a good bit of every day, working, crafting, napping, chatting, listening to music. Who knew my craft room would turn out to be the new Family Room?